I loved this recipe so much that I made it again with twice the quantities and with some tweaks to try and improve the result. Having had problems with tunneling of large airholes and heavy texture the last time, I did away with the use of an electric mixer to avoid over-beating. I made this in exactly the same way I make muffins – quick and easy, by hand. 1) Sift all dry ingredients thoroughly. 3) Mix dry and wet ingredients until just incorporated. Do not overmix. 4) Pour into greased baking tins. Do not fill tins more than half-full as the batter will rise about three times its volume. This happened even though I reduced the amount of baking powder to the same quantity I use for my muffins. 5) Bake at 180°C for 55 to 60 mins, covering with aluminum foil after 30 mins. When the loaves come out the oven, as they cool, they will rapidly deflate (see photo above). I’ve never seen this happen before with other baked goods. However, the final result was still pretty good. 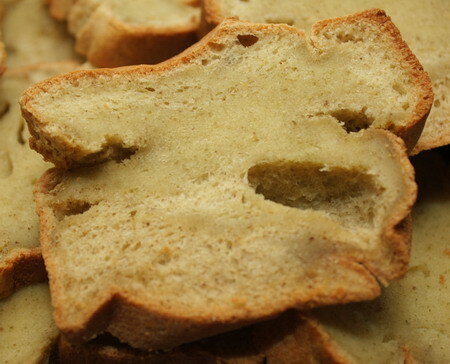 The photo below illustrates the light crumb texture that looks remarkably like ‘real’ bread. Today I tried out the basic yeast-free bread recipe from The Gluten-Free Gourmet Bakes Bread by Bette Hagman, using the Four Flour Bean Mix described in my previous posting with the standard supermarket flours using in Indian cooking (Mustafa being the only supermarket I know that stocks them, though!). The result was rather uneven: some parts did not rise much – the very smooth, close-textured parts – and other parts had huge air bubbles. However, taste-wise and in terms of ‘mouth-feel’, I’m pleasantly surprised! 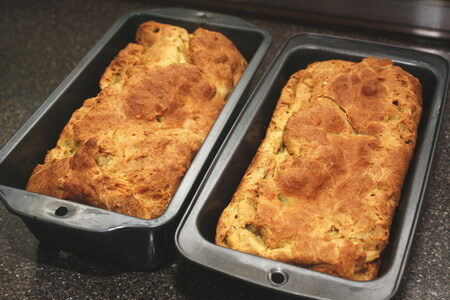 The very green smell from the green bean flour disappeared after baking, and the bread was springy to the touch, much like real bread (despite the cake-like appearance). Actually, the texture reminds me very much of kueh lapis! I tried it with a variety of savoury and sweet toppings as well as plain with butter, and it tasted fine every time. I couldn’t stop eating… how wonderful to be able to eat ‘bread’ and not be worrying about exceeding my wheat & gluten limit. Preheat oven to 180°C. Grease loaf pan(s) and dust lightly with rice flour. In a large bowl, beat eggs and egg white(s). Add melted butter, honey and buttermilk. Blend with mixer on low speed. Add dry ingredients and continue to blend on low speed. Add ‘sufficient water to make the dough the consistency of cake batter.’ This was the hard part! What is the correct consistency? I’ve seen a whole range of consistencies of cake batters. Anyway, using my judgement, I only needed to add about a tablespoon of water. The batter was strange-looking because of all those sticky flours, the cornstarch and tapioca starch, not at all like cake batter. Beat 1 minute on high. Spoon into prepared pans and bake for 55 to 60 mins, covering with aluminum foil after 30 mins. * The bread rose tremendously in the oven the collapsed afterwards, which suggests that I should reduce the amount of leavening agent next time. * The texture was very uneven, it did not affect the taste, but certainly is less than ideal. Bette Hagman constantly gives strict instructions to follow recipes exactly as substituting ingredients may end up with a different result. As usual, I can never follow a recipe precisely so I guess I will have to keep experimenting. * Hagman also suggests that overly dense texture might be due too much liquid, and from my experience with muffins (which is what this essentially is – a muffin method, dry + wet ingredients then mix) is that it could also be case of over-mixing. I might just make this by hand next time; the mixer is unecessary and might have contributed to the over-mixing. Whatever the problems, I was really pleased with the result. I fear the little test loaf in the freezer won’t last long at all. Am definitely making this again, and at double the quantity :). 31/10/08 Update: experimented with this recipe a second time, making some tweaks and getting a much better result. 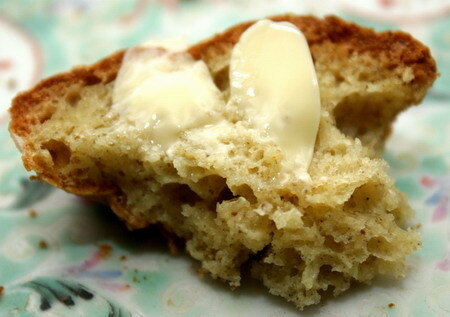 Read more here: Improved recipe for gluten-free, yeast-free bean bread. I’ve mentioned this several times before but I’ve never really written it up properly and have decided to do so to have a quick reference for myself. 1 cup milk + slightly less than 1/4 tsp citric acid. In all cases, let the mixture stand for five to ten minutes before using. These subs. are good for baking and batters – not for uncooked foods like dressings. 1 cup milk plus 1 1/2 Tablespoons of fresh lemon juice OR 1 1/3 Tablespoons of cider vinegar to above milk amount.